A commercial fire can be just as devastating as a house fire, and the effects may reach even further. They can leave employees out of work, business owners with damage costs, and the owners of the property with a ton of loss and repair needs. After facing a fire, it can be a challenge to know how to move ahead. However, taking immediate action is essential if you are hoping to minimize the damage and the resulting costs. The faster things get fixed, the faster employees can return to work and get the business running again. 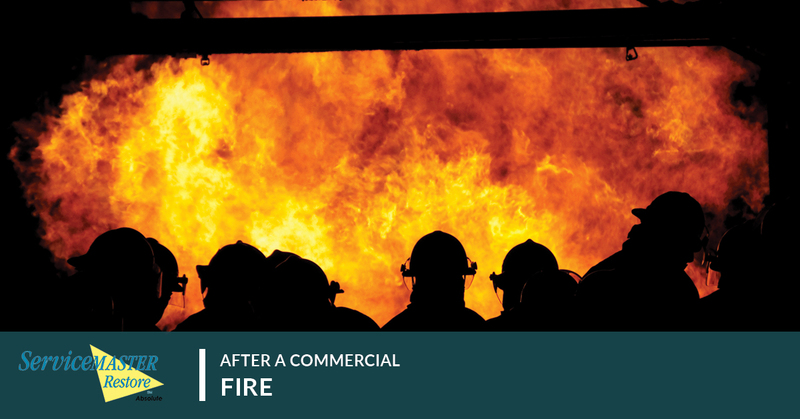 Here are some of the top ways to get your business back on track after a commercial fire. The minute the flames are put out and you know that everyone is safe, your insurance company should be the first ones to know about the damage. They will send someone out to examine the damage, take notes, and file the claim. Next, they should offer you the money you need to begin fire damage restoration and cleaning. This is where we come in, so talk to your insurance agent about SM Absolute, your premier choice when it comes to commercial fire damage restoration. Since ServiceMaster is available nationwide, it is very likely that your insurance company has already worked with us in the past. After the insurance agent has been notified, it’s time to reach out to us. The good news is, we have many professionals on our team that are available to help you 24 hours a day, seven days a week. Whatever your emergency situation may be, we can help. With professionals that have been highly trained to handle all of our equipment and a team that only uses the finest and more efficient tools on the market, you can be sure that we are prepared to handle the mess at hand. The fire is gone, but that doesn’t mean that the smoke odors cannot harm you. In fact, these are quite dangerous and can lead to even worse destruction of your property. This includes everything from the foundation and the walls to personal items lying around. Once you are allowed back in the building (if the fire department has determined that it is safe to do so), make sure you wear a breathing mask. No one wants smoke in their lungs. We also recommend wearing gloves to prevent the oil on your hands from further damaging anything that has been weakened in the fire. Make a note of everything that has been damaged, and be sure to take pictures! If you are not allowed inside the building, then document as much of the exterior as you can as evidence of the flames. Make a note of all valuable property items, including phones, computers, machines, documents, and whatever else. Trust us, there is no such thing as too much documentation. The more information you can provide, the more money your insurance company will be able to provide so that you can clean up and rebuild. For those of you who are allowed inside the building, try to save as much as you can. This includes machinery and personal items, as well as any other salvageable equipment. Cover them if you can, or remove the items from the area if possible. After a fire, the smoke and soot will actually settle onto surfaces and lead to permanent damage. Prevent the further damage whenever you can! When it comes to handling the damage after a fire, we are the team to call. By taking action now, you can make sure that your property is back up and running in no time at all. There will be repairs to purchase, claims to organize, time to wait before you can go back, paperwork to sort through, and customers to contact about the situation. Let our team help set you up for success and help everyone move forward. At SM Absolute, we know that a commercial fire is at best stressful, and at worst, traumatic. However, our technicians are on hand and ready to help you make this as smooth of a process as possible. We look forward to working quickly and efficiently to repair your business, but we would also be happy to work with your insurance company for you. That way, you can focus on what matters right away. Reach out to us today if you need our services!